Winter can really get you down the most. My solutions to winter this winter included a) cook everything with bacon and b) escape at earliest possible opportunity for warmer climes. I fled to Cairo a few weeks ago, where I found, I kid you not, an Arabic cookbook written by King Fuad’s chef de cuisine. It is…epic. More on that later. Earlier this week I thought I’d returned to lovely warm spring weather, but yesterday proved me wrong with its rain and snow and cold. So lest old man winter threaten us once again, I figured I’d finally dig out this recipe and post it. Just in case. 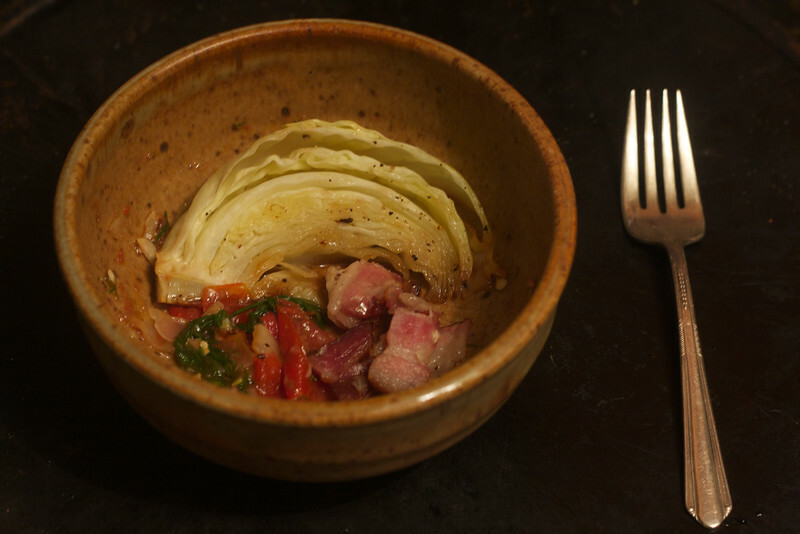 It’s my new favorite way to prepare cabbage (though I bet it would work beautifully with brussels sprouts too), and for those of you who are fans of Gazan cuisine (or just spicy food in general), it is also my new favorite way to eat dagga––the deliciously hot Gazan condiment that pairs poorly with nothing, but pairs with this dish especially well. You might say that bacon, cabbage, and dagga make for an odd combination. “Strange bedfellows,” as my Arabic professor used to say. But sometimes the strangest combinations are the best. Wash the cabbage and remove any outer sad-looking bits. Cut into eight wedges. Next, arrange the wedges in a baking dish (or, better yet, a solid cast-iron pan). 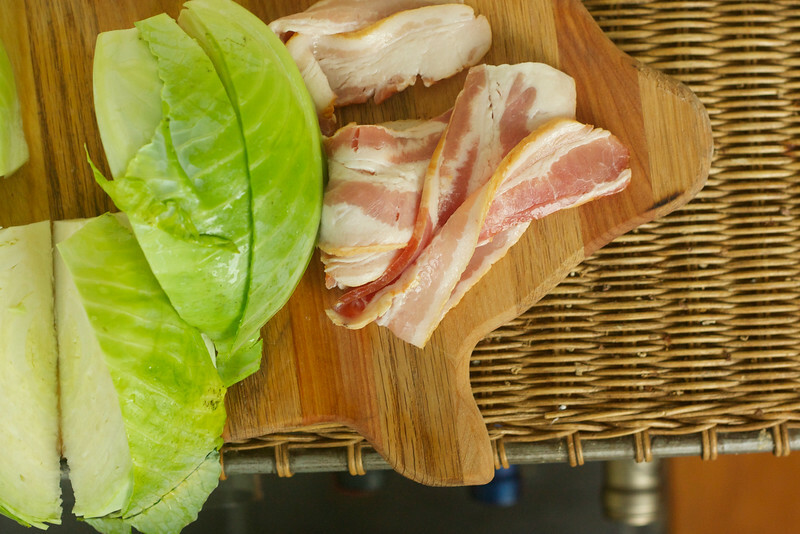 There are several ways to do this: you can slice your bacon up into bits, as shown here, or you can wrap up the cabbage in a bacon sash. There is no wrong way. 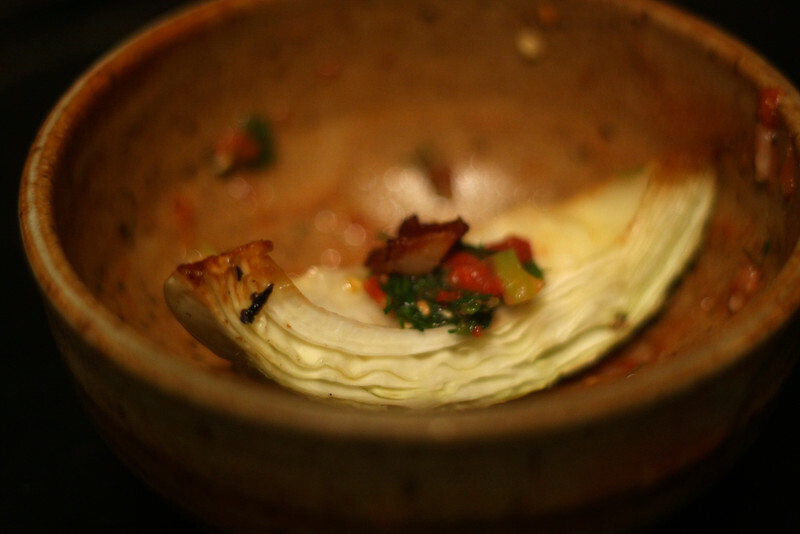 You just want to maximize the bacon-cabbage contact points, and make sure that at least some of the bacon has the chance to drizzle down onto the bottom of the pan so the edges of the cabbage can soak up that delicious grease. Sprinkle with salt and pepper, drizzle with olive oil, and roast for 30 minutes. Unlike the original recipe I prefer not to flip the wedges over mid-roasting, because I love the effect when one edge of the wedge has been roasting right against the bottom of the pan the whole delicious time. But what I do tend to do with this recipe is adjust the bacon halfway through roasting to make sure as much cabbage surface area got to hang out with bacon surface area as possible. The best part is, as I have mentioned, serving it up with a touch of spicy dagga. 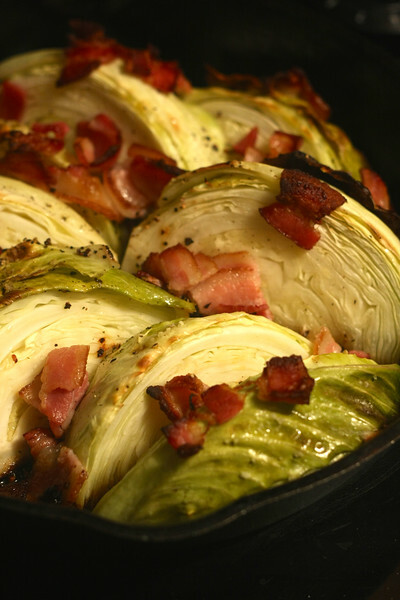 The sweet-savory blend of the roasted cabbage with the bacon is perfectly offset by a touch of heat. And as you can see, presentation options abound. Skewer with a toothpick and it would be very easily platable for a dinner party. Happy spring and happy munching everyone! See all photos here.